This clinical guide and practical reference is ideal for those who use and combine liquid herbal remedies for the individual needs of the patient. 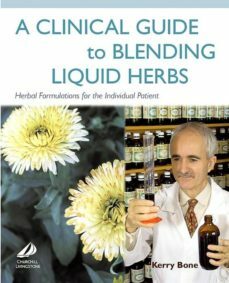 With three introductory chapters, 125 monographs, and various glossaries and appendices, it covers the fundamental concepts of using liquid herbals, including how the remedies are made, quality issues, and dosage guidelines. The monographs include full prescribing information that covers actions, indications, contraindications, warnings and precautions, interactions, side effects, dosage, traditional usage, pharmacological research, clinical studies, and full references.Focuses solely on liquid herbal preparations — making it a must-have resource and the only book of its kind.Covers approximately 125 herb profiles in detail.Offers the widest range of research-backed information currently available on herbs.Begins with basic principles to give practitioners confidence in the accuracy and precision of their prescriptions.Written by one of the leading names in herbal medicine.Clinically relevant with quick access to dosage information, contraindications, and more.